Clyde Naval Gazing: A spot of fishing? 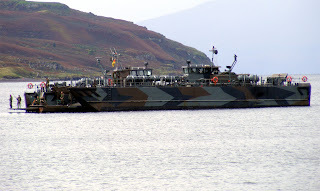 Two Royal Netherlands Navy landing craft (L9523 in the foreground) from Johan de Witt L801 enjoy a spot of angling in Millport Bay 02 October 2008. Even the squally showers did not appear to dissuade them!